Here are some great stories about Giving Tuesday and recent giving days, and a webinar about our groundbreaking Giving Day Index. Female donors gave slightly smaller average gifts than men, but they participated in greater numbers and generated 61 percent of all dollars raised on last year’s day of philanthropy, according to a new study by Indiana University researchers. According to data reported by Blackbaud, Giving Tuesday 2017 has yielded at least a 28% increase in online giving over 2016 campaigns. In 2016, Giving Tuesday yielded over 168 million in donations…. 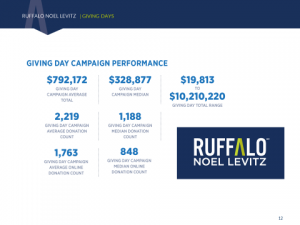 If you’re reading about all the recent giving day success and want to get your program in the game, check out this webinar which reviews over $30M in giving day results to explore best practices. And drop us a line to help take your Giving Day to the next level with RNL Giving Days powered by the ScaleFunder platform.